I know, I’ve been MIA for a bit. I’ve been up to my elbows in tomatoes, literally. September is looking like a pretty hectic month and I needed to make sure I got my tomato canning in. With the next three weekends booked, last Saturday seemed like my only option so I headed down to the Fort Greene Greenmarket and my favorite farm, Wilklow Orchards, to pick up 50 pounds. Where they sat, all weekend while we visited family in Jersey. Part of me hoped we’d return to find them magically transformed into chopped and sauced tomatoes, but alas, these weren’t the self canning variety. Instead, I’ve spent the past three nights canning. Coming home around 5pm, and peeling, cutting and canning until near midnight each evening. It’s the peeling that really gets me, a step required for chopped or whole tomatoes. 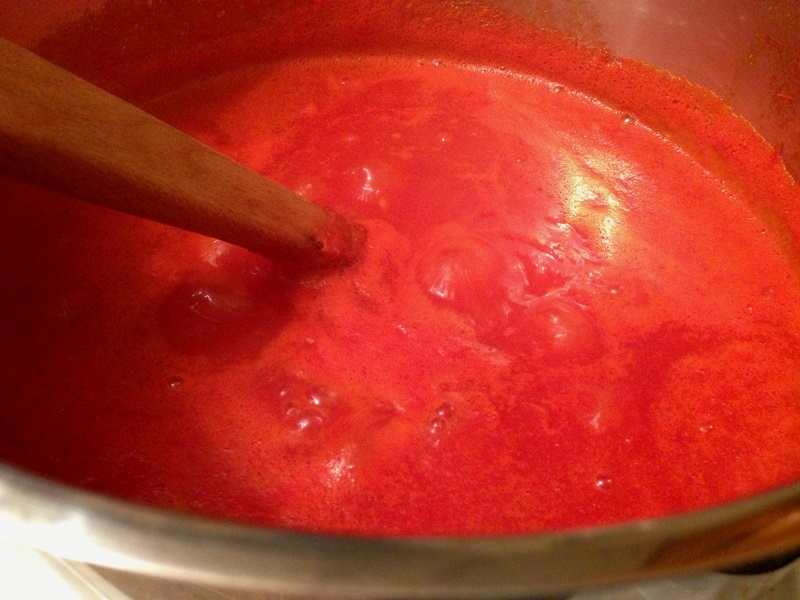 For marinara sauce, you can leave them unpeeled and push everything through a food mill before cooking it down to a thicker sauce. Though if you’ve ever messed around with a food mill in tomatoes, it’s not the easiest or cleanest job. I feel like I loose half my tomatoes with the skin and end up with a fraction of the yield promised. BUT this year I discovered the secret to easy sauce, higher yield and less skin problems. Squash might very well be one of my favorite vegetables. I’ve never heard a person say, “I don’t like squash.” There are so many varieties, saying you dislike squash is like saying you don’t like herbs. It’s hard to generalize. I’m not a huge fan of spaghetti squash. Perhaps it’s because I don’t quite “get it”. But shying away from that one variety isn’t going to put me off squash for life. In the summer, I love zucchini, bright yellow summer squash and all the mini variations that come with it. Winter warms me to butternut squash, acorn squash and pumpkin (yes, pumpkin is a squash too!). I put up both summer and winter varieties, shredded or chopped in the summer, pureed in the winter so I’m never without. 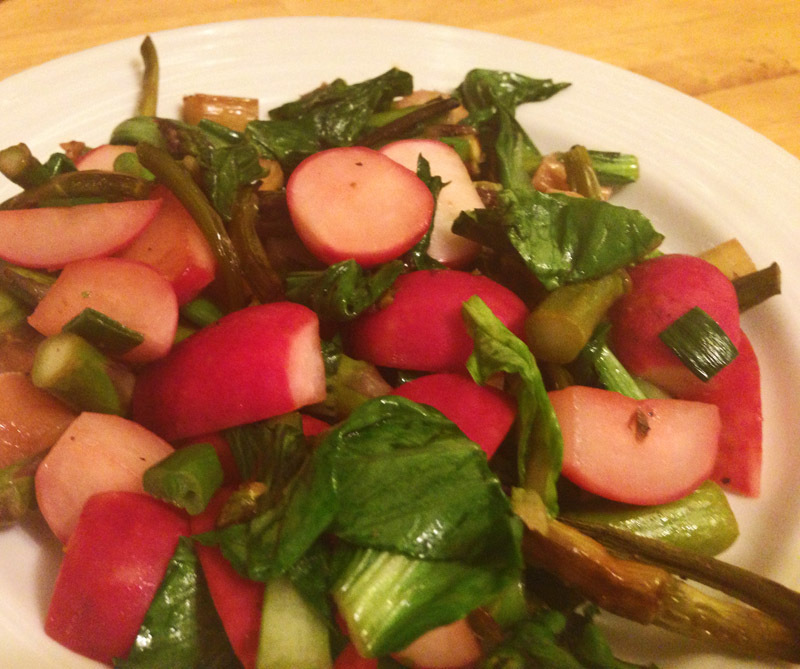 This simple meal has comforted me in both kitchens home and away. When my friend and I backpacked through Europe after college (wow, almost a decade ago…) it because a staple of our diet anytime we had access to a kitchen, whether it was the communal “kitchen” of a hostel or our own apartment for the week. It was a dish that made us feel normal. For a few moments, we weren’t dirty travelers living our of our backpacks for the next 10 weeks, having picnics of bread, fruit and cheese from the local Aldi and saving up for real restaurant dinners when we could (not that it wasn’t great!). But it was the moments when we had access to a kitchen that were magical. When we could pretend that we weren’t moving every few days, but grounded, just for a few days. We dined on pasta, salads, soups and occasionally some chicken or beef. 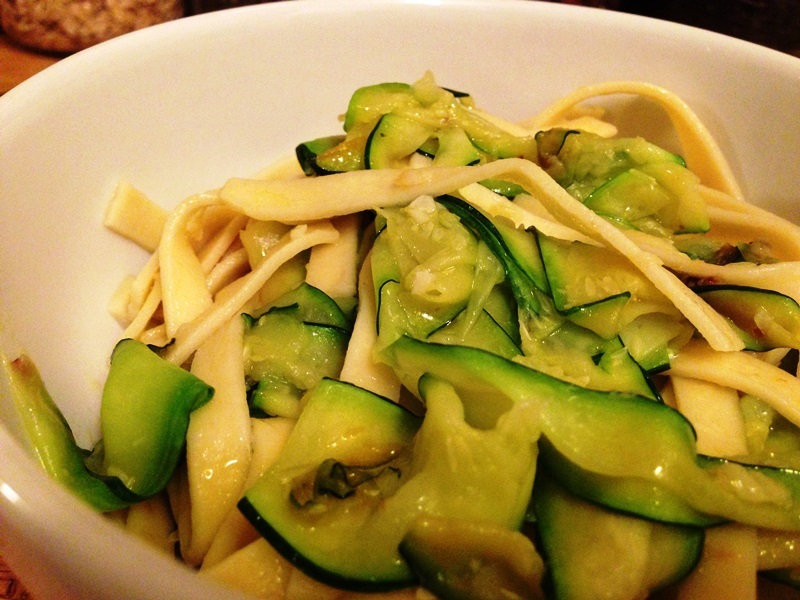 The meals were always simple as we had a limited pantry to work with, but somehow the zucchini over pasta was always a favorite. 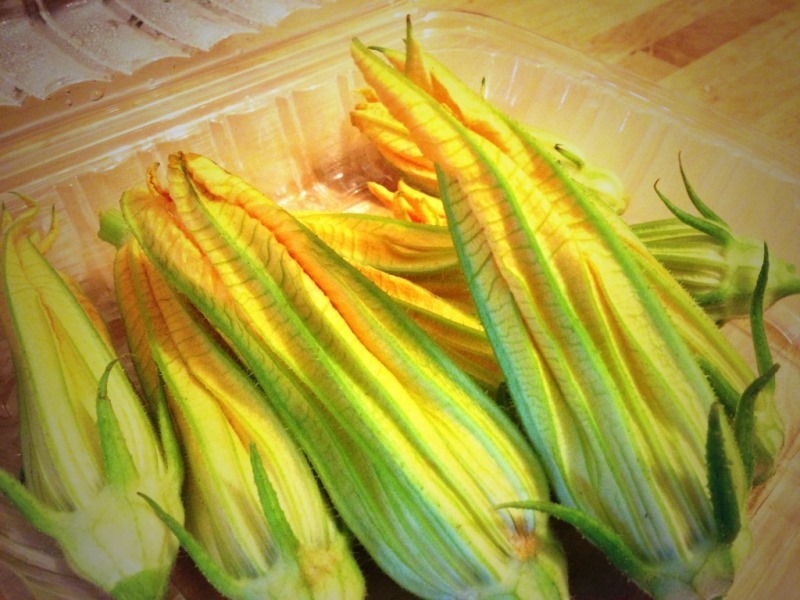 Every year I tell myself I’m going to do something with those beautiful pale yellow squash blossoms and every year I fail. When they sat right in front of me at a recent Bay Ridge Food Co-op distribution, I no longer had a way to ignore them. I went home with a dozen of the light puffs in hand, still no idea what to do with them. When posed to my twitter friends what to do, an overwhelming cry of “fry them!” came back. I’ve never really deep-fried anything. Beignets once when I was a child, but after the labor of making the dough, cutting, waiting for them to rise before I even got to the hot oil stage, I promised myself never again. But how much trouble could squash blossoms be? There’s not much dough involved and no yeast or rising. I picked up a bottle of canola oil on my way home and was ready for something new. Locavore living isn’t always easy. 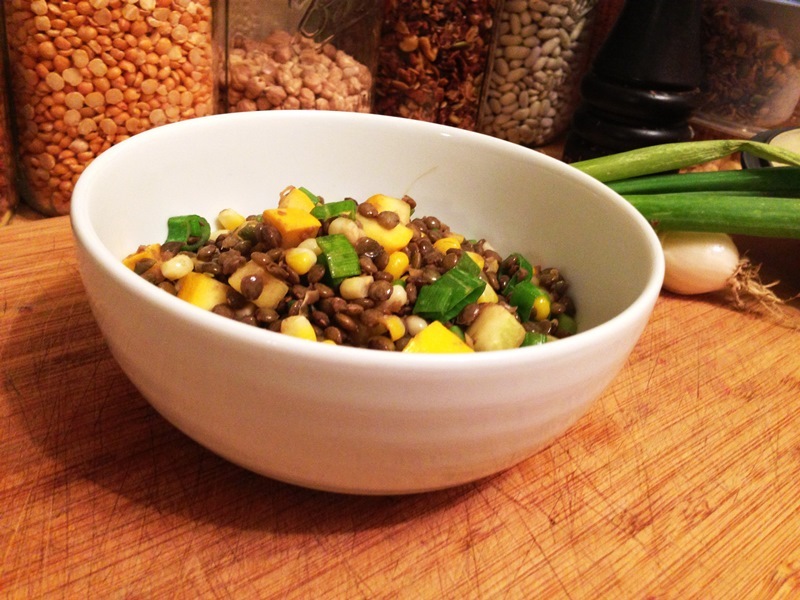 The bulk of our winter food consists of root vegetables, beans, grains, greens, frozen and canned stuff. We cheat a bit, mostly with stuff we wouldn’t be able to get around here anyway like citrus and avocados. But for the most part we try to live locally. So when spring arrives and the Greenmarkets start showing evidence of food other than cellared winter produce, you can imagine I get a bit excited. Too excited, maybe. I fill my bags with asparagus, ramps, lettuce and quarts of strawberries, completely ignoring how perishable some items are and there’s only two mouths to feed. I started canning for just that reason, to make sure we weren’t wasting things. Most meals use a little of this and a little of that, leaving me with odd quantities of produce left over, threatening to spoil. In the winter, all these things would easily be tossed into a kitchen sink stew, cooking on the stove or in the slow cooker for hours, maybe with some beef or sausage. However in the warmth of the summer, I want nothing like that. So my kitchen sink meals get a bit more creative.